Another day, another photo-sharing service. If it seems like there’s a new way of sharing your photos pops every few days, well, that’s because there is, virtually. 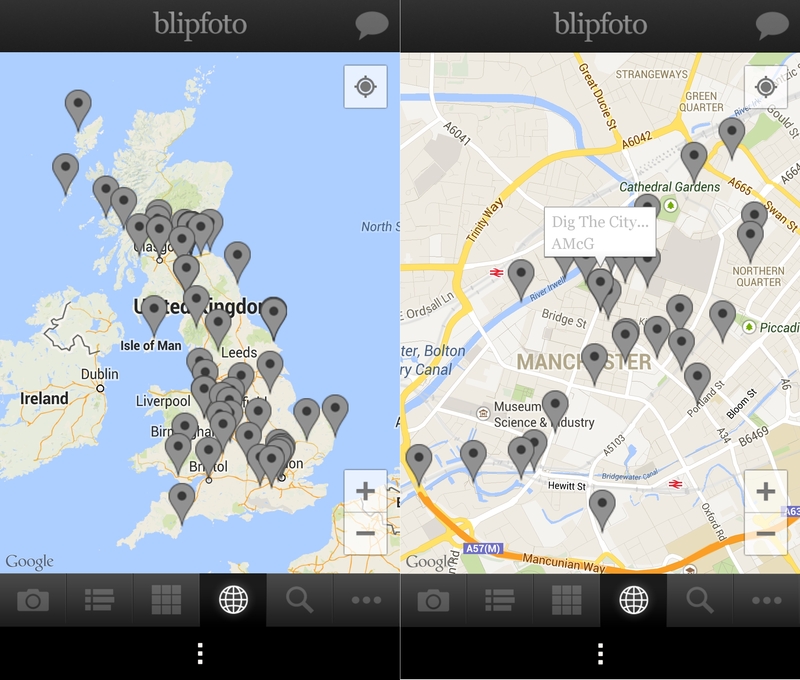 Blipfoto however, a product of Edinburgh-based co-founders Joe Tree and Graham Maclachlan, has been around since 2004, but it has only now gotten around to launching an Android app despite having versions for the iPhone and iPad. To be fair, it was only a side project until it received seed funding in 2010, and then more in 2012. “Mobile traffic already accounts for well over a third of Blip’s visits and is growing fast, so we have to ensure that the experience is as rich, intuitive and enjoyable as possible. Our new Android app allows us to extend this enhanced experience across a whole new range of devices,” Joe Tree, founder and CEO of Blipfoto, said. 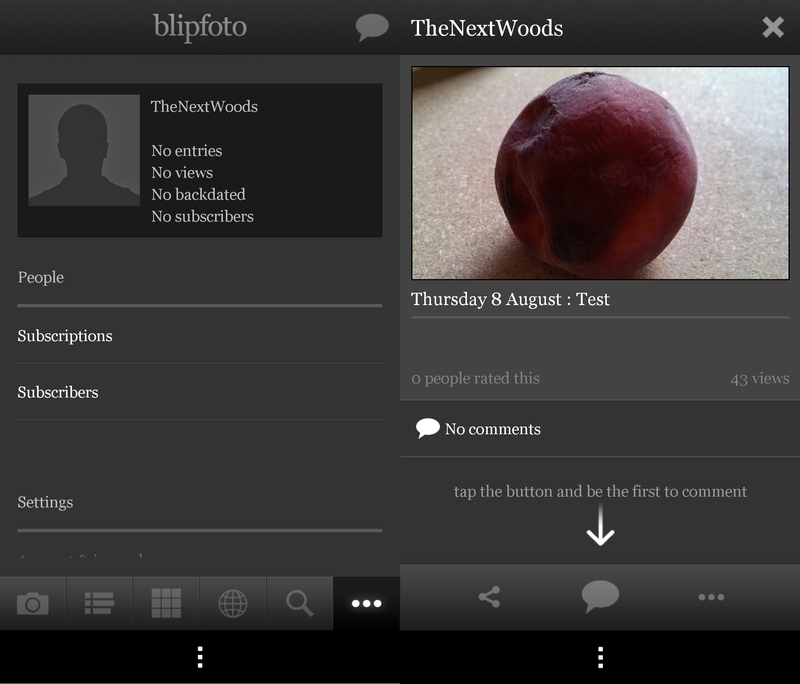 Unlike some other platforms, Blipfoto allows users to share pictures to their profile but it’s considered more of a photo journal platform than straight photo-sharing, as such users can only share one picture per day and are only allowed to upload new photographs, rather than scans or old ones. That’s really the point of the service. Signing up is as simple as either registering with your email address or doing it via Twitter or Facebook, though, you’ll still need to fill out a few details the first time even if you choose to log in this way. Once in, you’re presented with the option to take a photo and upload it, or choose one from your phone’s (or tablet’s) library in the first tab. The next tab along is a chronological activity feed of photos from other members, and the third is a photo grid view that you can sort by everything, people you’re subscribed to, photos geo-tagged close to you, just your own, spotlight, top rated or ones that you have favorited. The third tab along shows tweets around you on a map, zoomable, naturally. Tapping on any of the dots will pop up a little information box, tapping that will take you directly to that entry. The final tab (signified by the … next to the magnifying glass in these screenshots) takes you to your account details where you can keep track of things like people that you subscribe to, and those who subscribe to you, as well as settings for the news feed, account, reminders etc. Mine looks rather empty, having just joined up. Clicking on your profile box at the top will take you to your own feed. Each picture gets a title, and underneath it there’s room for a full and proper description. If you want to see a better example, and someone who knows how to use a camera, check out the shots below. 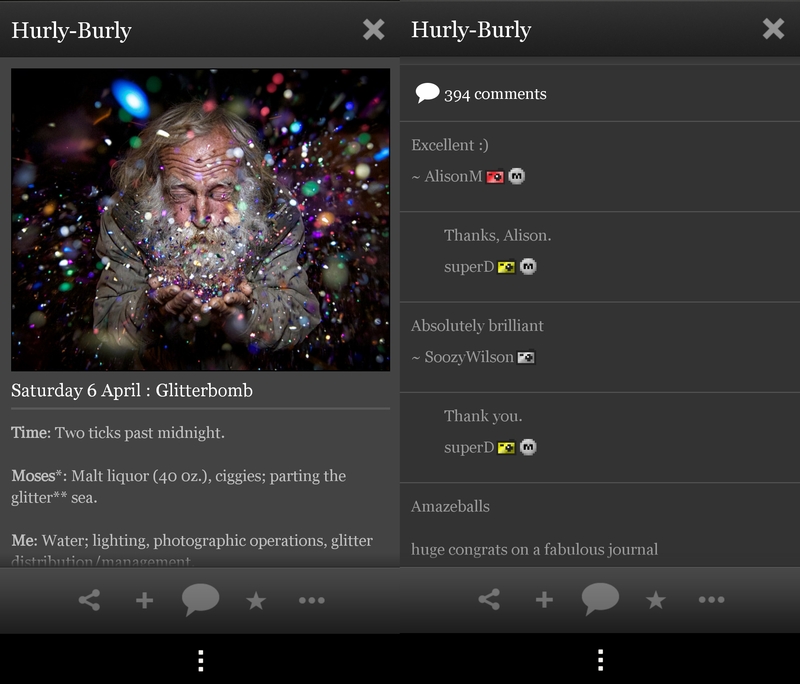 It’s also easy enough to comment, share or favorite any pictures you come across using the tabs at the bottom of the screen. 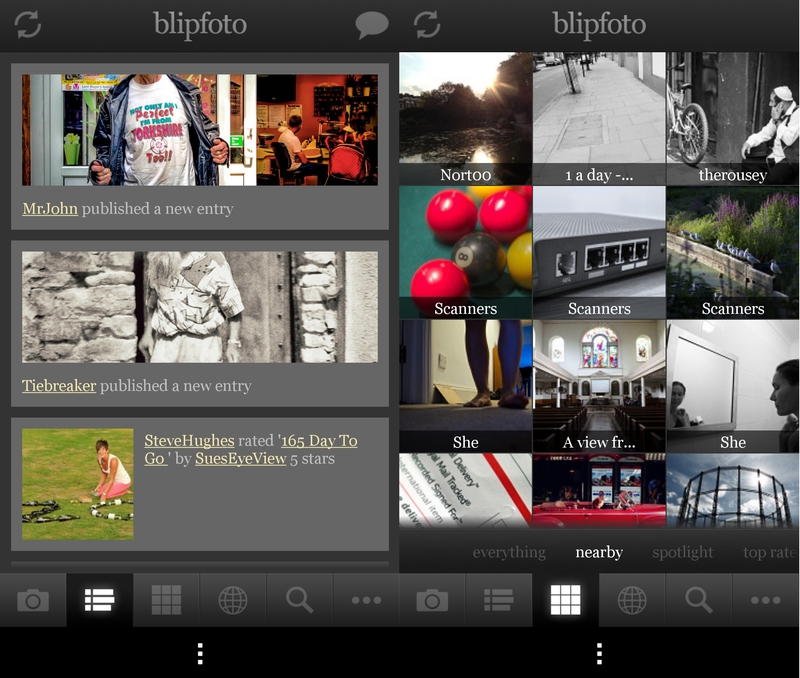 I like Blipfoto. It’s simple and to the point. If you want to be in touch with a world of photographers, semi-pros and amateurs alike, you can do a lot worse than Blipfoto. That’s not to say it’s perfect; I registered via Twitter, and when I was taking that test shot, I was unaware it Tweeted it automatically. Once I had realized, I took a look in the settings, but alas, couldn’t see a way to easily switch that off, given that you’ll only be posting one picture (journal entry) per day it’s not likely to be too much of a problem, but it would have been nice to have been told explicitly in advance that this would happen. Foibles aside, Blipfoto is a long overdue app for Android photography fans, and it’s refreshing to log-on to a service that describes itself as a photo journal-oriented social network and not see endless pictures of other people’s dinner and a bunch of ‘selfies’. I hope it stays that way. The app wasn’t live on the Google Play store at the time of writing, but should be available to download before the end of the day.